mapping the present and the future. Whether engaging in person-centered design or making a story quilt, the process unfolds in six steps, during which we successively co-initiate, co-sense and reflect, find a pattern, presence, co-create, and co-evolve. including his Theory U (pictured schematically below right) which provides such a clear and universal framework for the process of creativity and change. space, and energy to the creative process. hunches, and symbols. Let inspiration and serendipity in. 4. Presence: Connect to sources of inspiration and will; make space for inner knowledge, symbols, archetypes, music, and words to emerge. Ask what we have learned and how wisdom has entered each of us through the journey. Express and share a vision with others. 5. 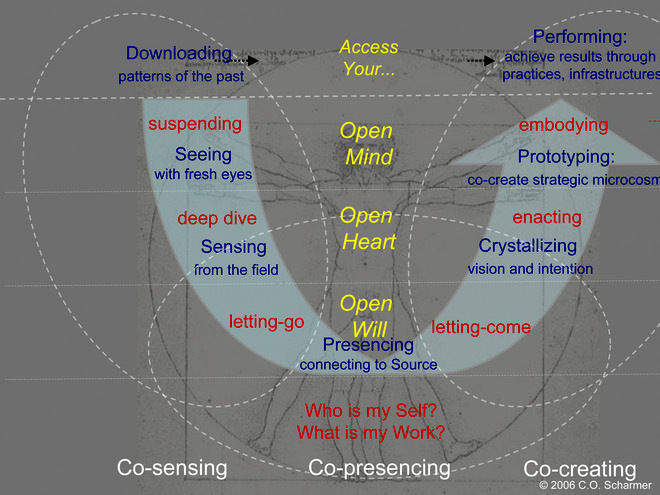 Co-create: Fabricate and prototype images to express wisdom and hopes for emerging futures. Experiment and re-vision until the image emerges fully. Try things, seize possibilities, adapt to limitations. 6. Co-evolve: Enter public spaces; join with others to share and express the whole through story-telling. Bring our insights and images to light through performance, presentations, display, performance and media. Engage others in reflection, discovery, and response.